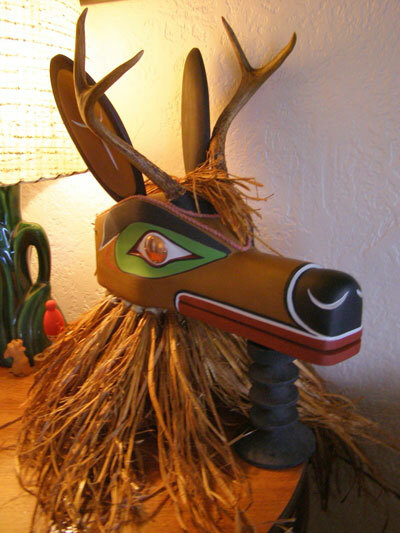 Description: Salish Ceremonal Deer Mask carved from cedar and painted by westcoast artist James Leslie. It is 18"x12"x 30" with real deer horns embedded in the head of the deer. It has copper eyes and a skirt of braided cedar bark to hide the dancer underneath as the dancer wore it on his head and looked up and down and around to the drum beat and chanting. It was used in Salish Ceremony on the Westcoast of Canada. It is titled and signed by the artist James Leslie in pencil inside the head. An impressive and unique work.